Kepard is a new VPN provider that was initiated in 2012, with the purpose of aiding internet users in safely transferring an unlimited quantity of encrypted data when browsing, the company has slowly built its reputation and now its fair share of followers, and still continues to advance ahead. It provides competitive pricing, with rates such as $7 for one month’s service, $19 for three months, allowing users to save ten percent, allowing savings of up to sixty percent for one year, at a rate of $35. The company also offers prospective clients a trial service, in which access to its VPN servers is permitted for thirty minutes everyday. Users are able to connect with Open VPN, PPTP and L2TP protocols, with unlimited speeds and data transfers. Kepard also offers a NAT Firewall, to doubly ensure the protection and privacy of its customers, who can connect to their system with two devices at once. 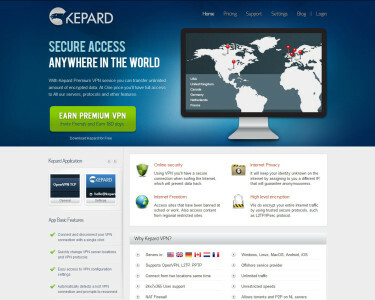 You can see a comparison of kepard and other VPN Providers at http://www.vpndienste.net/. The Kepard system also function as an accessible application on Android and iOS systems, allowing easy connection and disconnection, automatic server location updates, as well as automatic reconnection prompts. The service includes user support twenty four hours, seven day a week and has servers in North America, Germany, England, France and the Netherlands, where peer to peer torrent downloading is permitted. The company does not infringe on the privacy of its users, and keep information which include, session times, the registered user email address, and the authentic IP address, on record for a maximum of three days. Currently Kepard is offering three months of premium virtual private network service free of charge on android devices. This offer, paired with the free trial, provides a way for the customer to test the services before making a commitment, making this company one of the better options for VPN providers. Smart DNS or VPN – What is better?